Sheffield University - Why Study anywhere else? In lycra too? I wish I could do that on my DH bike!!!! Wow. Better pinner than i've seen a lot of DH riders do. Thats UK style XC for you!! lol.... he did not hold it, just great timing with this shot. That bike is not even close to a XC setup, the bars are too wide, no front derailleur and look at the size of that headset tube !!!! I think that might just work ! It`s evolution baby!!!! Only idiots hate on XC. All XC means to me is a long ride with ups and downs - no comment on gnar or airtime. Some of the most challenging terrain I've ever ridden has been on XC rides - needs more skill to ride smoothly than pilot a bike down a wide open fast DH track, that's for sure. He totally ate Shiz. You always look where you are going, and he's looking at the dirt. Yeah, i ride abit of everything tbh, and im not great rider, but everyone is great in their own fields, ask a XC guy to ride fortbill/champrey and they cant, ask most DH people to ride uphill on a 15mile XC course and they probably cant. People should respect what peoples strenghts are, and help them with their weanesses, instead of mocking them! @Stinkysam.... most Dh boys who race anyway ride lots, train hard and are not to shabby at XC. Probably why Dh boys have done real well at the Enduro series this year, the top juniors are ex downhillers and some still are downhillers, and events like the Strathpuffer have been won by teams consisting of downhillers. I can ride Fort Bill and 15 miles XC no probs. Betsie - it isnt often like that, many people view DH as the only decent discipline. We are lucky up here that pigeon holing is not that common, more common amongst the older riders TBH. I am not considered an XC rider by people my age, even though I ride lots of XC, just because I race Dh. going to go out on a wing and say POD. yey ruari, your using clips!! how could he come out of it? now thats how to ride xc! Is this the same guy that was in another super low cornering shot on a previous pod? Not hating, just wondered if it was. yes it is. famous Ruari. hell yeah i wish i could ride berms being parallel to the ground! You can picture it, his bar is a 1/2 second away from digging into the dirt and spitting him off! Just saw this pic come up on my Facebook feed from VitalMTB and I thought this will probably get POD on Pinkbike soon, I then jump over to Pinkbike and BOOM it's POD. Can I see the future? the face says it all.....total commitment! same thing I was thinking! wow! complete trust of his bike, tires and skills! how long can you go , can you go down low, all the way to the flow , sick! That's got to be a woman surely?! The bland area would make him look really cool and stand out if he were wearing brighter colours. Nice pic anyways!!! "hmm, I wonder how close I can get my face to the ground without tasting it?" That's a stretch to say this has good composition. The colors are dull and the photo is overall pretty grainy. Needless to say this is POD worthy for how hard he's railing though! Typical UK setup, make sense as it is the same way as on the motorbikes, however I find it strange too on the pushbikes. Most of the Europe rides with the left=front setup. is the rear shifter on the right or left???? Could be just personal preference, i live un canada and ride with the front on the right, mind you i was born in england. Why can my xc be like that? I would start ridding xc again! WOO thats some sick XC riding You should mount a little wheel on your bar end dude!! GUOOOOOOOOOOOOOOOOOOOOOOOOO increíble, saldrá de este peralte pedaleando o quedara en el piso??? 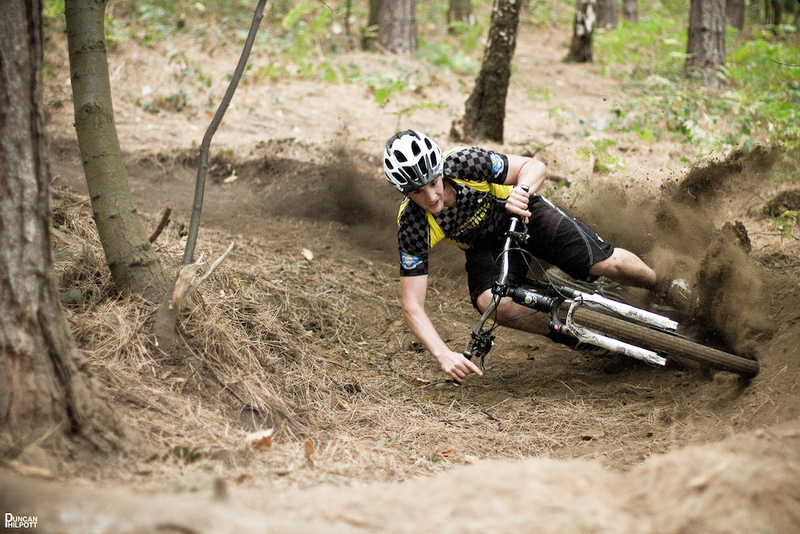 Haha wow pinkbike has this as there POD today and vital mtb has this as the daily shot. defying gravity and other laws of physics- this must be put on a resume. how does he go that low on that berm? f#ck sake Ruari 3 pods now, great picture and pinned as ever ! soo badass!! makes me want to ride..
any riding on dirt is good, period . I did that today! uuunnnggghhh! This is crap mate. I could do bettr. single chainring on the front, not full on xc bike. its not a xc bike if it has saint brakes and a thru axel fork and belive me hes not wearing lycra. great photo! POD..... whats the bike ?? Mythic/banshee Rune ????????? Definition of shred a trail ride! I smell a beautiful Crash! Oh im sure he manged to right himself! This guy needs a DH bike and a full face helmet..
Yea he's just that small..
im sorry to say but i doubt he made it out of that burm. the right side of his handle bars is 2 inches from the dirt! dude that guy doesnt make it either. his right foot is way off the pedal and at the angle hes going down fi sure. RUARI-RHUBARB ... you are a freakin BEAST !!! I just went and checked out the rest of your pics that DUNCANP has on you (AMAZING shots by the way duncan) and they just blew my mind !!! I can rip it up for the most part but i got NOTHING on that, you definitely got the skills to pay the bills !!! BIG PROPS to you my man, keep it pinned !!! OREO1700 - uhhhhhhhh, i hate to tell you this but thats the same guy in both pics !!! Foot way out front off the pedal is how i would slash a berm getting that low, MOTO STYLE !!! Check out the rest of his pics, I may not have been a bystander like BIGBLUE but he owned that corner ... like several others apparently !!! Don't be hating cause you cant get low, get low !!! haha, don't boost his ego too much! DUNCANP: Did this guy ride out of this corner or not? I'll post up the next shot in the sequence tomorrow morning haha.. i enjoy listening to all the theories. Would have been cooler if it were a DH bike..
What makes it cool is that it isn't a DH bike. It's inspirational. for real^ i just recently invested in a Salsa SS rigid 29er and it's been treating me great. Having a DH bike, AM/XC bike and now a rigid is so awesome. you really get to be one with the trail. then when I get on my 9"er I feel like I can really shred some gnar. video/pic sequence or he didn't ride out. sick piccture either way. to see is not to believe, artard. lol, did you stop to think that maybe i just wanted to see the video?